Not sure what to make of the date printed on that tub of yogurt? Questioning the freshness of those week-old farmer's market eggs? Don't fret. Follow the tips below to understand expiration once and for all. Here's some food for thought: Expiration dates refer to quality and freshness of food, not safety. (Yep, that's a shocker!) So, even if a food item passes its expiration date, that item could technically still be safe to eat. We dug a little deeper to find out what different types of "expiration" dates really indicate, and if they can be useful for consumers. Expiration dates on food and drink products are not required or regulated by Federal administrators, with the exception of infant formula. Those mysterious dates printed on food containers telling us when to purchase, eat, or throw out that tub of yogurt by are actually decided by each individual manufacturer. "Sell-By." This number is for the store, letting employers know how long a certain product can stay on the shelf. You should buy the food item before this date passes to ensure it's fresh. "Best if Used Before/By." This date helps specify when a product is at its peak freshness. It does not indicate the safety of the item. Buy and use before this date for best quality. "Use-By." These dates indicate when a product will start deteriorating in quality and flavor. (Again, it's not a safety guide!) Again, it's best to buy and use products before this date for best quality, but consuming the product a few days late won't kill ya. Closed or coded dates. These are packing codes that track the product when it is being shipped. These codes are typically a series of numbers and letters that indicate dates and times the container was filled, and places of manufacture. (They look something like this: 045B97 April 11, 2008.) They should not be interpreted as "use-by" dates. Unfortunately, there's no predetermined number of days that determine how long certain foods stay edible. However, the USDA recommends following the "Use-By" date on food packages just to stay on the safe side. 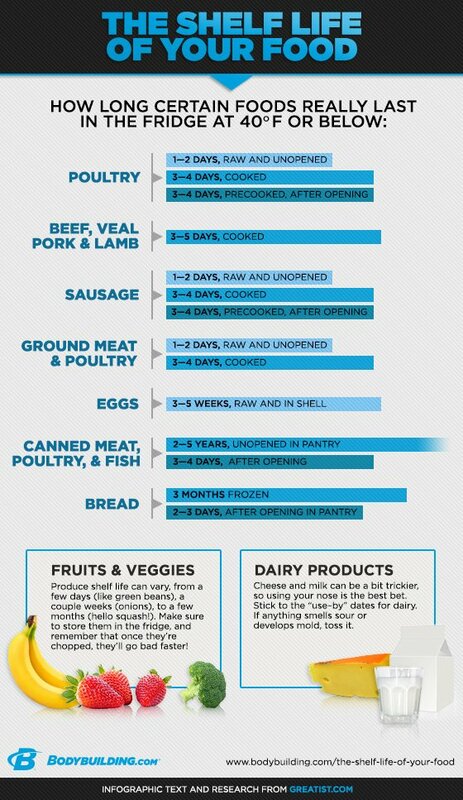 We can't just go by the numbers and forgo properly storing food. (That carton of milk will go bad overnight on the kitchen counter regardless of its expiration date!) Food spoilage depends just as much on storing conditions as it does time on the shelf. So take into account these tips to help keep food fresh and safe. Set it right. Make sure the fridge is set at or below 40 and the freezer is set at 0 degrees Fahrenheit. If your cooling dial doesn't have exact temperatures noted, place a thermometer in the center of the refrigerator overnight for an accurate reading. Unpack promptly. After you get back from the grocery store, refrigerate or freeze perishables or pre-cooked foods within two hours to avoid spoiling. Eat it or freeze it. Food safety experts suggest consumers eat or freeze meat within two days of purchasing. The reason? Raw meat is typically kept around 30 degrees Fahrenheit in the store, while refrigerators at home are typically set around 40 degrees (so veggies won't freeze)! Don't let it linger. Don't eat sliced produce, meat, poultry, and eggs if they've been left out for more than two hours. The same goes for milk—while it may last for five days past its sell-by date in the fridge, it will quickly spoil if it's not kept cold. And remember! Whole cooked dishes and leftovers can go bad too, so it's best to chuck that leftover chinese after three or four days in the fridge.